Get a tent, we bring the pARTy! pARTytent © is a temporary exhibitionplace for artworks of a changing group of Dutch artists. While travelling around, Anke Land and Pier Pennings bring along the work of six carefully selected Dutch artists in their hand-luggage. Wherever they perch an art-organisation or artists-initiative pitches a pARTytent for one day in or in front of their location. In this tent Anke and Pier show the artworks. The local art-organisation invites a group of her “own” artists in the tent with works to confront them. If you want to meet them, mail them! 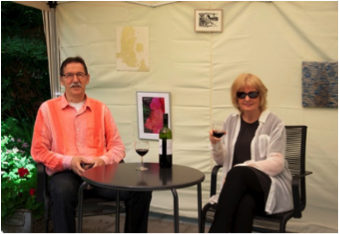 Are you a challenging and innovative art-organisation or artists-initative, Anke and Pier can turn your partytent into thé pARTytent.